Most Mississippians have heard of Casey Jones, the railroad engineer who became an American folk hero. But few know the real story behind Jones or any of the other colorful men who rode the rails of Mississippi during the golden age of steam. Bruce Gurner of Water Valley loved to tell all about them. Gurner was a retired railroader and school teacher who spent almost 50 years researching Jones and the Mississippi Division of the Illinois Central Railroad, which was with headquarters in Water Valley. In October of 1940 he began working as a machinist apprentice in the Puducah, Kentucky, railroad shop. By August of 1941 he was working on the road as a fireman. A few months later he was drafted and served four years in the Army. 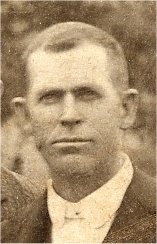 After the war, Gurner railroaded for a short time before enrolling at Ole Miss. He received his Masters Degree in education in 1950 and began teaching junior high science at University High School in Oxford. He taught for 16 years, all the time working summers and Christmas vacations on the railroad. In spring of 1965 he had to choose between his two careers. Railroading won. Because of his seniority as a fireman, he was able to spend two years on the famous passenger train, City of New Orleans. He later became an engineer and retired in 1978. His hobby of collecting railroad memorabilia began in 1955 when the Water Valley depot was being torn down. Truckloads of old railroad records were being hauled to the trash heap. He saved as many as he could and took them home. Another time Gurner was told about a trunk which had been stored for years in the back a downtown grocery store. In it he found the records for the local lodge of the Brotherhood of Locomotive Firemen of which Casey Jones was a member. The record books were soiled and beginning to fall apart, so he hand copied each page. By the early 1970’s, he had accumulated enough pieces of the Casey Jones puzzle to publish his account of the wreck at Vaughan, which took Jones’s life. He said that the day would come when he could ask Casey why he didn’t jump. Bruce Gurner passed away February 18, 2002. It is his collection of railroad memorabilia that makes up the majority of the Water Valley Casey Jones Railroad Museum collection. Bruce Gurner believed of all the men who ran engines out of Water Valley in Casey Jones's time, the most colorful was "Whistle and Run" Charlie Dunn. the Illinois Central Railroad. And he belonged to all three." Dunn was a very devout Christian and Gurner remembers his father, B. G., saying Dunn would bow his head over the reverse lever of his engine and say a little prayer. "When he got to Canton he'd do the same thing. He'd thank the Lord for a safe trip." "He would always pray before they left the garage in their big old car. The family agreed that was what he should do because he was a terrible driver." Around 1910 the Dunn family went to Annapolis to see son Lucius graduate from the Navel Academy. "As the ceremonies were beginning, Mrs. Dunn noticed her husband was not with them. Looking about the huge auditorium, she and her daughter, Ella Clyde, discovered he was on the stage with the Vice President, Secretary of the Navy and other honored guests." What happened, Gurner says, was that Dunn, in his ever-prevailing spirit of good fellowship, had gone up to shake hands with the dignitaries. An alert attendant brought another chair thinking this fine-looking gentleman must certainly be one of the dignitaries who was to sit on the stage. "The beautiful part of the story is that the family was not in the least embarrassed. Why should they be. After all, who was an Admiral when compared to the best passenger engineer on the Illinois Central Railroad?" Dunn worked as an engineer from 1884 until 1931. One day he was coming into Water Valley on #23 and "just about the time he blew for the north crossing, Mrs. Dunn, who had been in the hospital for several days, turned to Ella Clyde and said, 'There comes Papa.' She died before he got to the depot." his pension. He turned in his switch key and rule book. That's all they had ever given him." 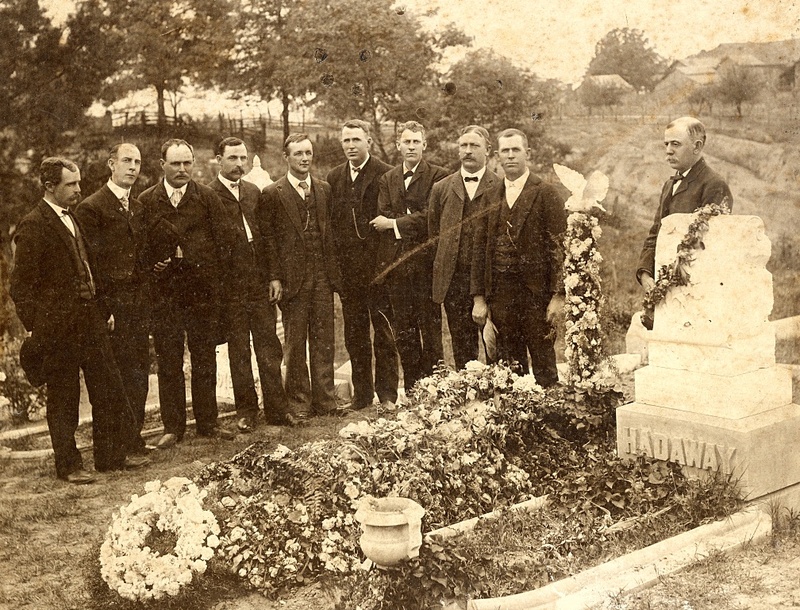 This photograph from which the image of Charlie Dunn was taken shows the lodge brothers of the local Brotherhood of Locomotive Engineers, Division 99, at the funeral of Bill Hadaway on May 11, 1904. They are from left to right, Arthur Mills, Archie Smith, B. A. “Tobe” Boydston, Henry Blackston, Jack Kirby, “Red” Myers, Ed King, Pete Ohlson, Charley Dunn, and Mr. Hadaway’s brother. This tragic scene was enacted all too often in this period of heavy traffic on the dangerous single track railroads of the time. This accident occurred when engine 936 struck a cow and overturned in the “Graveyard Dip” a mile or so north of Middleburg, Tennessee. Ironically, Mr. Hadaway had been appointed night roundhouse foreman in the Water Valley shops and was making one last trip to Jackson to get his clothes and turn in the key to his locker. His fireman, Henry Johnson, was also killed in this wreck. Johnson had been with Bob Everett in a wreck just south of Water Valley three weeks before. Johnson jumped, but Everett was scalded and died. The district Road Master had come along to ride the engine and “feel the track” to Grand Junction and he too was killed. Hadaway, a widower with two little girls, had married only two weeks before to a lady from Winona. The 110-year-old grave-site is located on the main road leading into Oak Hill Cemetery on the left (west) a hundred feet or so from the main gate.